This is why Rudy Giuliani is in Armenia right now. It’s about cyber warfare, the midterms, and what he did with twenty million Americans medical data. European media reported yesterday that Rudy Giuliani is currently in Armenia, attending a forum dedicated to the Eurasian Economic Union at the invitation of Russian-Armenian businessman Ara Abrahamyan. Today, as a “private citizen”, Giuliani met with Defense Minister Davit Tonoyan and received a briefing on Armenia’s security. He is scheduled to speak this week alongside Sergei Glazyev, a Russian official who is sanctioned by the U.S. This is what Giuliani is really up to in Armenia. Since being named President Trump’s “informal” Cybersecurity Advisor in January 2017, Giuliani has traveled the globe negotiating contracts with foreign governments to provide “cybersecurity” consulting services through his private security firm. At the same time, he has operated as a secret backchannel to Ukraine, Russia, and Israel, surreptitiously negotiating quid-pro-quo deals on behalf of Trump. One such foreign government is the City of Kharkiv, Ukraine, whose Mayor Gennadiy Kernes is a former Party of Regions leader. 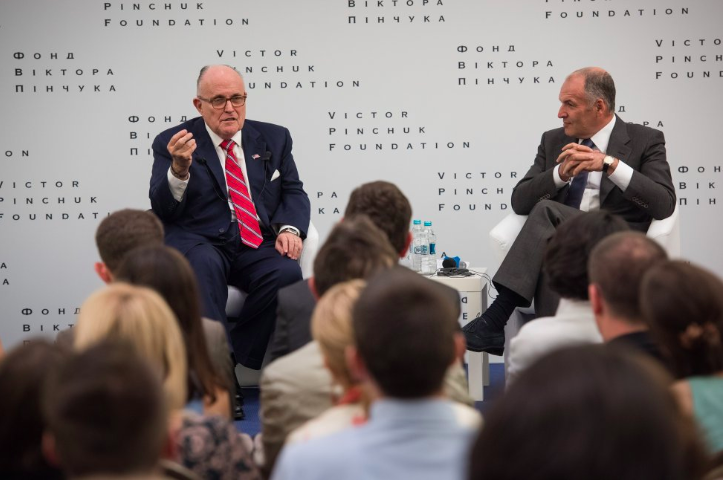 The firm that facilitated Giuliani’s contract with Kharkiv in May 2017 is Tri-Global Strategic Ventures, linked to both Russian and Ukrainian governments. Giuliani first worked with Tri-Global in 2004, when they arranged for him to met with Foreign Minister Sergey Lavrov on a trip to Moscow. Since then, Tri-Global has arranged several other projects between Giuliani, Russian companies, and Ukrainian politicians. In 2017, under cover of it’s “cybersecurity” contract with Kharkiv, Giuliani and his firm Giuliani Security and Safety LLC traveled to Ukraine at least four times. During Giuliani’s two visits in June and November, he met with President Petro Poroshenko and several oligarchs under investigation by Robert Mueller. 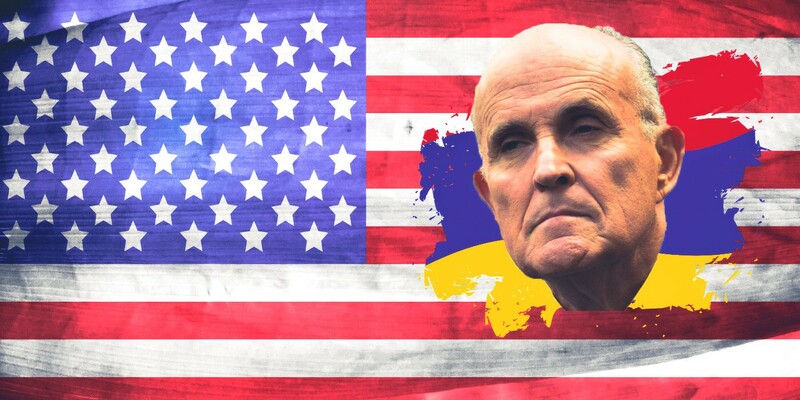 Giuliani also secured an additional contract with the City of Kiev, whose Mayor Vitali Klitschko is an established client of Giuliani’s firm through Tri-Global. Alarmingly, Giuliani and his firm’s 2017 visits to Ukraine coincide with significant developments in the Special Counsel investigation, U.S. cyber policy, and U.S. negotiations with Ukraine regarding it’s long-sought lethal arms deal. For instance, the firm’s first trip to Kharkiv occurred just a few short days before Trump fired FBI Director James Comey. On May 9, the day Comey was fired and while the GSS team was in Ukraine, Giuliani traveled to Washington D.C. for a stay at Trump International Hotel and meetings at the White House. Also on that day, Giuliani’s firm announced on it’s website it had kicked-off a “cybersecurity” contract with the city’s government. The following day, Giuliani visited the White House as President Trump infamously hosted Sergey Lavrov and Sergey Kislyak in the Oval Office. Also at the White House that day was Ukrainian Foreign Minister Pavlo Klimkin, who met with Vice President Mike Pence before getting a short photo-op with President Trump. Giuliani then traveled to Kiev, Ukraine in June 2017, shortly after rumors had begun to swirl in Ukraine that a bribe had been paid by Poroshenko for access to President Trump. These bribe allegations weren’t reported in U.S. media until a year later in May 2018, when Paul Wood published a single-sourced article using information gathered from a military intelligence officer. While in Kiev, Giuliani reportedly met with President Poroshenko and other government officials, including FM Klimkin. He also gave a talk on global security at the Victor Pinchuk Foundation. Pinchuk is under investigation by the Special Counsel for a $150,000 donation he made to the Trump Foundation in 2015. In July 2017, Trump held his first meeting with Putin during the G20 summit. 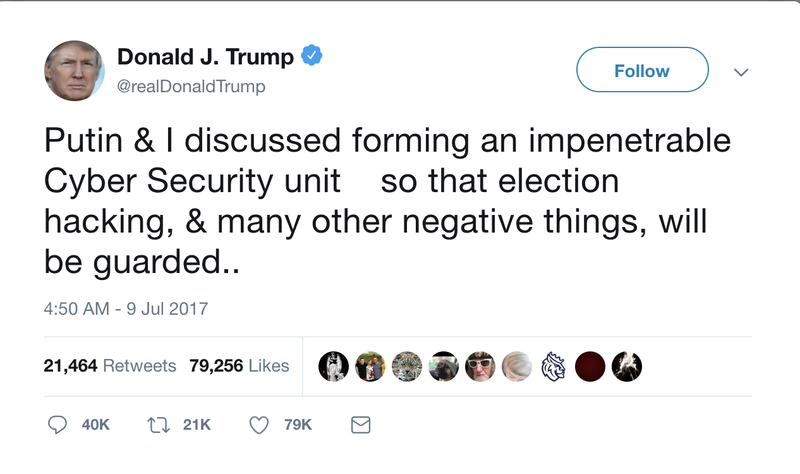 The day after the summit, on July 9, Trump made his widely-panned announcement of a “Joint Cyber Task Force” with Russia. Although the idea was reportedly “shelved”, the State Department shuttered its Office on Cyber Issues less than two weeks later. The shuttering was announced on the same day Giuliani’s team traveled back from their second meeting in Ukraine with Kharkiv officials. Giuliani’s second trip to Ukraine was in November 2017, coinciding with the U.S. approval of an arms package to present to the Ukrainian Government. Giuliani arrived in Kharkiv on the private jet of Alexander Rovt, a Ukrainian-American reportedly under investigation by Robert Mueller. During his visit, he met with Kernes and presented security recommendations that he assured the Mayor were supported by the U.S. government. It was later reported in U.S. media that the Ukrainian Government ceased cooperating with the Mueller investigation in November 2017 and subsequently dropped investigations into Paul Manafort. “Study the setup and experience of the Offices for Public Security and Offices for Emergency Management in the states of New York and New Jersey”. A few weeks later, Poroshenko confirmed receipt of Ukraine’s javelin missiles. What about the medical data? In June, Page Six reported on an affair Giuliani was allegedly having with a hospital administrator in New Hampshire named Dr. Maria Ryan. The article focused on an overnight stay Giuliani had taken at a mountain resort, alongside Ryan and three mystery men. 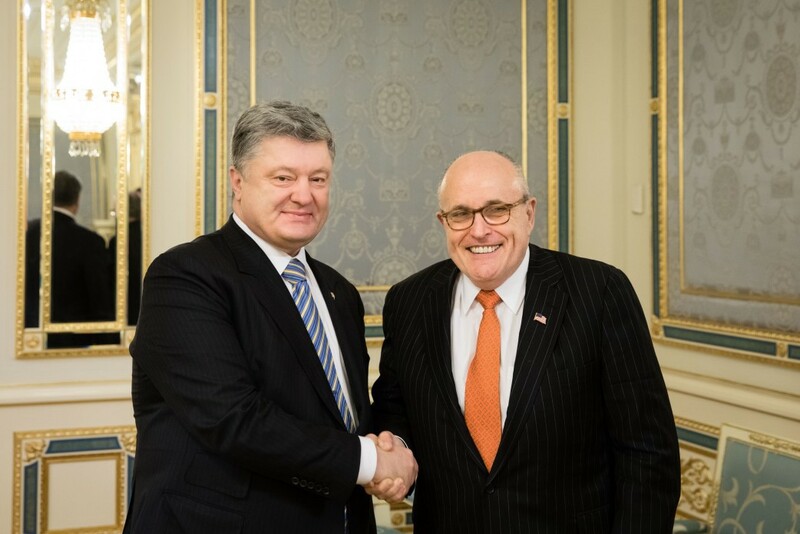 The stay occured on March 29, just two days after the Kharkiv delegation met with Giuliani in NYC. A closer review of Giuliani’s activities in New Hampshire suggest something more nefarious than an affair. Local NH media reported on Giuliani’s visit at the time, with news channels shooting b-roll and getting interviews on-site at Dr. Ryan’s Cottage Hospital. AthenaHealth was soon subjected to a hostile takeover by GOP mega-donor Paul Singer. The pro-Israeli businessman sat on the company’s board and had been waging a year-long “terror campaign” against the company’s CEO Jonathan Bush. Singer also happened to have been a major fundraiser for Giuliani during his failed 2008 presidential bid and they maintain ties. In June, Giuliani traveled with Dr. Ryan to Israel to tour a Jerusalem Hospital linked to the Russian Government. Hadassah Medical Organization, which was bailed out from massive debt by Netanyahu in 2015, announced last year that they had agreed to take part “in the creation of an international medical cluster in the territory of the Skolkovo Innovation Center” . 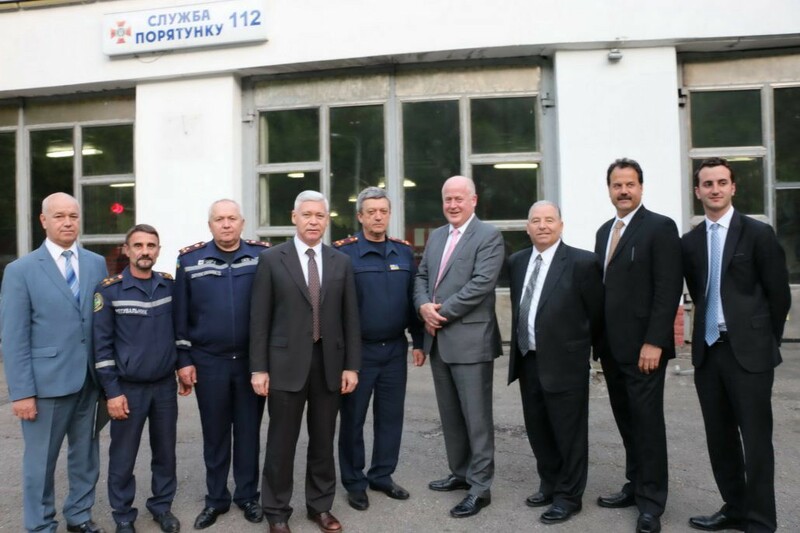 The project, in collaboration with the Mayor of Moscow Sergei Sobyanin, is headed by Ukrainian-born Russian businessman Viktor Vekselberg. During Giuliani’s “world tour” in June, he traveled to several other countries with Dr. Ryan, including France and Scotland — this according to Giuliani’s soon-to-be ex-wife Judith. In her scathing interview with New York Magazine, Judith also provided interesting details regarding Dr. Ryan’s extremist views against Iran, Giuliani’s drinking problem and his crew of crony hangers-on. On June 21, Louisiana Senator and Judiciary Committee Member John Kennedy announced he would be traveling with a delegation to Moscow over the 4th of July Holiday. Four days later, Giuliani appeared at a political event in Louisiana for a little-known congressional candidate. Over July 4th weekend, as the Senate delegation was in Moscow, Giuliani met with President Trump to advise him on his Supreme Court nomination. A few days later, on July 10th, Giuliani was in attendance for Trump’s White House announcement of Brett Kavanaugh. As the midterm elections approach, foreign influence campaigns have increased in intensity. This became starkly evident during the Kavanaugh hearings in August and September, where highly-targeted fake news articles about Dr. Christine Blasey Ford spread ferociously over social media. Just like in October 2016, U.S. intelligence issued a mostly-ignored warning to the public last week, describing the ongoing efforts of foreign governments to wage cyber warfare against U.S. citizens. Giuliani is now in Armenia two weeks before the election as planted news of an ISIS-infiltrated “caravan” spreads widely across mainstream media. National Security Advisor John Bolton is en route to Armenia from Russia, where he publicly contradicted his own intelligence agencies’ warning and claimed Russia had no impact on our 2016 election. What are they planning to do next? If past is prologue, Giuliani will be hinting at “a couple surprises left” in two days, on October 25, 2016. I mean 2018.